This page will discuss the family of John Johnson, Brother to Sven Johnson. Immigrated to Iowa in 1866 and Stanton County 1867. There are several documents that give us information on John Johnson and his family. This includes the Stanton Register along with books and other publications of the times. This is quoted from the: "History of the Elkhorn Valley Nebraska" An album of History and Biography, Compiled under the supervision of C.H. Scoville, published by the National Publishing Company, Chicago 1892, Omaha. Mr. Johnson was born in Norway, December 1833, and came to America in 1866, landing at Montreal, from which city he went to St. Ansgar, Iowa, and worked one year by the day. In 1867, he with his wife came to Nebraska. They drove overland by the way of Sioux City, he taking a homestead upon which the widow now lives. He built a log-house in which the family lived fourteen years. Like most of the homeseaders, they came to the country without means. They had an ox team, which he brought from Iowa, where he paid one hundred and eighty dollars for them. Mr. Johnson was the first white settler on the south side of the Elkhorn River in Stanton County. In 1874, he leased a quarter section of school land, which he held until the time of his death, since which time the widow has bought it. He also bought eighty acres in 1878, making her present landed interests three hundred and sixty-six acres. Mr. and Mrs. Johnson were united in marriage in 1862, in Norway, and to them nine children were born: John, Lena, Henry, Martin, Albert, Louis Sr. (deceased), Samuel T., Clara, Lewis Jr. Politically, Mr. Johnson was a Republican and never voted any other ticket. He and the family were consistent members of the Lutheran Church. He strove hard to provide a comfortable home for his family, and had succeeded quite well when he was cut off from life, May 14, 1884, by inflammation of the bowles. Mr. Johnson's father died in Norway, but at this time his mother is living in Stanton County. Mrs. Johnson's parents, both natives of Norway, died in that country." "The first Norwegian settlers were Johannes, or John, and Sven, or Swayne (Swain) Johnson, brothers... The thrift and cleanliness of these (Norwegian) housewives was notable. Mrs. John Johnson had purchased a bolt of cheescloth on her way to the honestead. From it she made white curtains for her sod house, which had to be relaundered each time it rained. These curtains were know up and down the Elkhorn Valley." 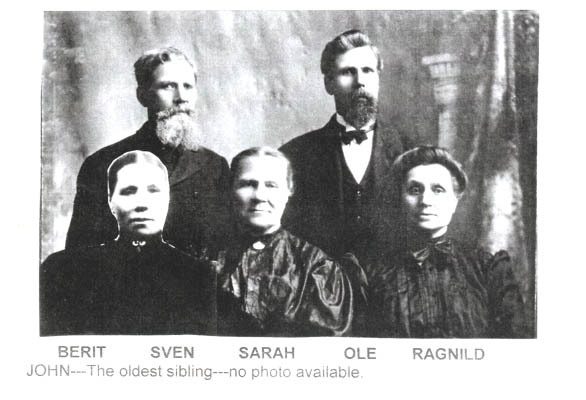 Margit Holstein was born in Norway, September 26, 1843 and united in marriage to John Johnson in 1861 in Norway and to them nine children were born, John, Lena, Henry deceased, Martin, Albert deceased, Louis Sr. deceased, Sam T., Clara, and Louis Jr. They came to America with their two children, Lena and John in 1866 landing at Montreal from which city they went to Iowa and worked one year by the day and in 1867 they came to Nebraska driving overland with oxen, taking a homestead, being the first white settlers on the south side of the Elkhorn. They came without means and among the many other strugglers built up the country. Mr. Johnson died May 14, 1884 and she worked alone on the homestead until the year 1893 when she moved to Stanton later moving to Omaha where she had lived until the last two weeks...to the home of her eldest son, John, where she passed away at the age of 74 years…she was laid to rest in the Norwegian cemetery. My great-grandfather, Knut Ivarsen Hustad, was born in Hemsedal in 1812. He emigrated to America in 1846, settling first in St.Ansgar, Iowa, but moving west in 1867 to Stanton County, Nebraska. In 1981 some of Knut’s descendants decided to have a family reunion. In a letter to me about that time, my Nebraska cousin, Maxine, wrote an intriguing sentence. She said, “Grandpa Thomas Everson often came to Stanton and Stayed at Sven Johnson’s (whose wife was his cousin)”. We were able to prove beyond a doubt that Knut Ivarsen’s niece, Margit Hallsteinsdatter Nordstrand, was the wife of John Johnson Midstrand, and that they emigrated to Nebraska, and that she was the cousin “Grandpa Thomas” had visited. Another interesting point this makes is that John and Margit spent the first year in St. Ansgar, Iowa before coming to Stanton County. They were there at the same time Knut Ivarsen (Eversen) Hustad was there. Then they both came to Stanton County in 1867. They must have traveled together and homesteaded in Stanton County at the same time. 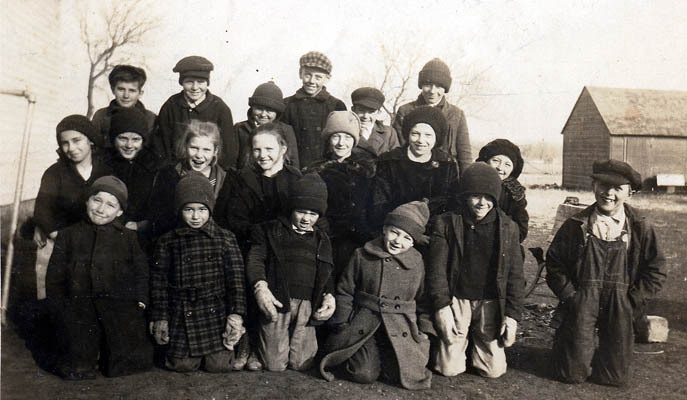 The picture below of District 19 students was taken in 1923. Maxine Everson was one of the students along with her sister Phyllis and brother Eugene. Also included are my father, Ellsworth, and his brother, Clifford. Kneeling (from left to right): Dallas Timperley, Emil Mastny, Martin Voelker, Eugene Everson, Richard Voelker Janes Bearden. 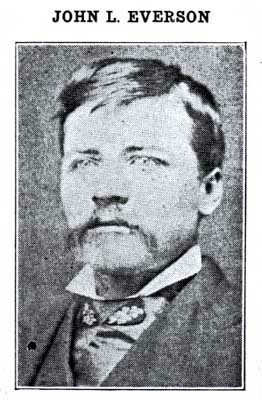 Johannes Johannesen Haugen traveled to Stanton County in 1867 from Iowa with the Everson family. The John Johnson, Knut Everson, and Halvor Halverson families were the first settlers on the south side of the Union Creek. The following is a description of John Everson that was published in a book written by H. Halderson (Attorney at Law, Newman Grove) called “Tri-County Pioneers”. It gives a good description of what it was like in 1867 getting started on the prairie in Stanton County. The Everson’s changed the spelling of their last name from Iverson to Everson to correspond with the way it was pronounced in Norwegian. John L. Everson was born in Clayton County, Iowa, November 30, 1851. His father, Knut Everson came to Dane County, Wisconsin from Norway in about 1845 moved to Clayton County, Iowa about 1850, and then to Mitchell county, Iowa, where the family lived until 1867, when they came to Stanton county, Nebraska. The Everson’s were the first settlers in Stanton County south of the Elkhorn River, and there Mr. and Mrs. Knut Everson and his three sons commenced the pioneer task of homebuilding in a wild region. They started with a team, 20 head of cattle and eight hundred dollars, but no farm tools. John L. Everson was then almost sixteen years old. For two years the Everson boys cut enough hay with scythes to feed all the stock, fine blue joint grass that grew about four feet high. They acquired three quarter sections of rich farm land and carried on a very extensive farm business as soon as they could buy farm machinery to work with. The nearest railroad was Fremont until 1872 when the Northwestern extended the road to Wisner. In 1867 a small colony of Germans, Herman Gerecke among them, had settled on, and near, the present town site of Norfolk but there were very few settlers between Norfolk and West Point. The important task of the first settlers was to induce people to come into that new country, and the Everson’s were very active and aggressive in performing their duty in this respect. John acquainted himself with land descriptions and could locate any piece of land in that part of Stanton County. He assisted newcomers in filing on homesteads and in a few years that section of the country was filled up with aggressive pioneers. John attended school several miles from his home where a homesteader from near Meadow Grove taught a few months during the winter. This teacher had to leave at noon on Fridays and left John in charge of the school the remainder of the day. Mr. and Mrs. Knut Everson sold the farms to the boys in the 70’s and returned to Iowa. John L. Everson and Gunder Thompson bought a threshing machine in 1873, the first in that section, and threshed, among other places, on the farm on which Judge George A Eberly of the Supreme Court of Nebraska was born, then, in 1873, owned by Judge Eberly's father. John became an active dealer in horses, a profitable business at this time. Old Timers say that he never took advantage of a newcomer in a horse trade. He engaged in the implement business in Stanton in the early 70's and was a member of the Village Board of Trustees when the town was organized. He served on the school board, was a member of the Stock Brand Commission, building committee, and was deputy sheriff. The members of the village board with whom he served were, Julius Posenecker, C. L. Lamb, Adam Pilger and Frank McGibbon. All deceased, leaving Mr. Everson the only survivor. While in the implement business, he sold an Appleby self-binder attachment to Anders Larson of Newman Grove. This was supposed to be the first self-binder device made for practical use and it is related that the company got it back for exhibition at the World's Fair in Chicago. On May 6, 1875 Mr. Everson was married to Miss Thompson, a sister of Gunder Thompson, at the office of County Judge Young, in Green Garden precinct. They established their home in Stanton where John engaged in the livery business after he retired from the implement business. An unusual incident in the life of Mr. Everson occurred while he was living in Stanton County. At an evening gathering of young people near Stanton two young men became abusive and were ordered out by Mr. Everson. They returned in a threatening manner, one with a neck yoke and another a single tree, and failing to desist after warning by Mr. Everson he fired a revolver in self defense resulting in the death of one of them. He was indicted and tried in the district court of Stanton County. The jury returned a verdict of not guilty after deliberating about one hour. Harry Brome, then a young lawyer practicing at Stanton and Norfolk, conducted his defense. Mr. Brome later became one of the leading lawyers in Omaha. Clinton Brome, his son, is a prominent lawyer in Omaha. In the early 80's he made a contract with E. M. Thomas and Becker and Welch of Columbus, to winter 174 head of cattle. During a fierce blizzard the whole herd drifted with the storm to the southeast but all 42 head were recovered several days afterwards at a farm near Clarkson. Mr. Everson has observed the transformation of the frontier into a dominion of homes, schools, churches, cities and charitable institutions. There was no Norfolk when he came, no Stanton, Madison or Newman Grove. He knew the first lawyers that came to practice in a11 those towns as well as the pioneer bankers, doctors and school teachers. He traveled a great deal in this region during the frontier days and became acquainted with the settlers in the various localities from West Point to Fullerton. It was truly a romantic life and the younger generations have cause to regret that they will never have opportunity to see as much of life as the pioneer who has lived here sixty-three years. The photograph below of John Everson was taken by an itinerant photographer when he was about twenty-three years old. Martin Johnson was born on the old homestead, now known as the Dave Dickinson farm, in Stanton County Nebraska, May 4, 1870, and died at Stanton, Nebraska, June 28, 1929, aged 59 years, 1 month and 24 days. Mr. Johnson's parents came to Stanton County in May 1867, coming as emigrants from Norway. Their nearest neighbor was 28 miles distant and in such solitude Mr. Johnson was born and reared. As an early pioneer, he developed those sterling qualities of character which have made him a man beloved by all who knew him... Mr. Johnson was united in marriage to Emma Roker January 28, 1904 and to this union were born three children, Ester, now Mrs Leo Pilger, Mabel and Walter... there live to morn his death three brothers and two sisters, John Johnson, now of Los Angeles, Samues Johnson, of Plainview, Nebraska, Louis Johnson, of Detroit, Michigan, Mrs. Lena Chambers of Omaha, Nebraska, and Mrs. H.F. Mielenz of Stanton, Nebraska; also a step son, Paul Roker of Stanton, and Shirle Gene Roker, a granddaughter..."
Note for researchers: Keep in mind that John Johnson (1834- 1884) had a son named John Johnson (1862 - ?) and, Sven Johnson (1837 - 1931) had a son named John S. (Sven) Johnson (1866 - 1921). John's son moved to Omaha and then Los Angeles and Sven's son married Mary Halverson and moved to Newman Grove.